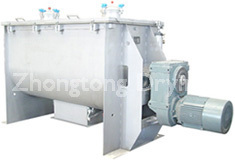 WLDH Series Horizontal Ribbon Mixer - Changzhou Fushite drying Engineering Co., Ltd. 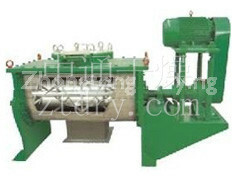 This machine is composed of container, screw stirring paddles and transitional parts; the screw paddle are generally made into 1 layer or 3 layers, the outer screw converge is the material to the centre front two sides, and the inner layer of screw conveys the material to the two sides from the centre, so as to form convection mixing. The cubage can be made into rotundity, so the jacket can be played in reaction and drying. Big coefficient of loading, small occupied area. The ribbon mixer is generally used in the mixing of viscous or adhesive powder material, or the mixing of powder which needs to add liquid, and paste material. 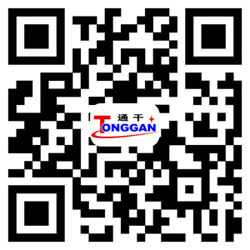 Meanwhile, because it is difficult to clean viscous material, the machine is suitable for the mixing case, where the output is large and there is no need of displacing material variety frequently.